Yes, potty training story books are an actual genre of young children’s literature. It’s all about helping kids learn how to use the toilet. Most of these books are for human children and feature human characters. 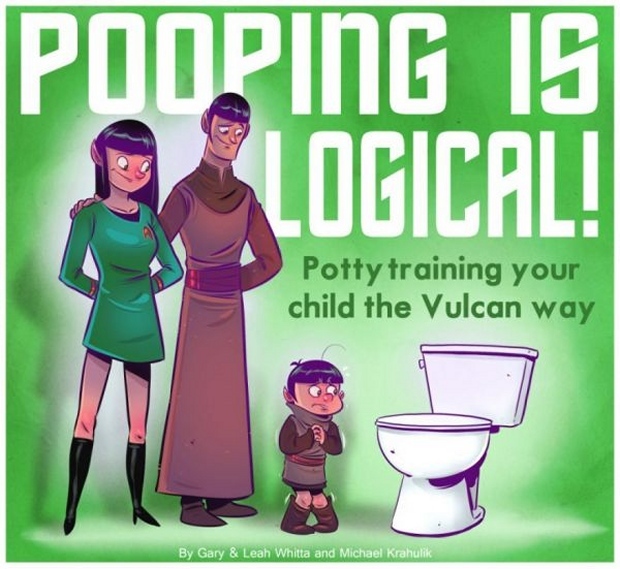 To mix things up, Gary Whitta is writing Pooping Is Logical: Potty Training Your Child the Vulcan Way. Because why not? Whitta is a screenwriter who wrote The Book of Eli and Star Wars: Rogue One. This is quite a departure from Hollywood blockbusters, but if you love Star Trek, you’ll want to share this book with your potty training child. It is ilustrated by Penny Arcade’s Mike Krahulik and it tells the story of a little Vulcan boy who is learning to use the bathroom. Apparently Whitta is having trouble getting copyright permission from the owners of Star Trek. But if and when does, this book could be used to teach your child to drop his shields and fire photons in the proper place.